Perhaps part of the reason the canine is such a desirable pet is that it is a very vocal animal, often communicating feelings, needs, and wants with their owners through varying verbal sounds. This comes as no surprise since dogs in the wild lead a social existence, communicating regularly with other members of their packs. As a pet owner, learning what the sounds and noises your dog makes mean can only help your relationship grow and flourish. If your dog is making noises of any sort, it means he or she has something to say about their emotions and the current state of their world. The number one communication tool for most dogs is their bark. Each dog uses their bark in different ways, depending on the situation and the context of an event. A pet owner may hear their dog bark both in play and under distress. To better understand the basic bark, there are a few things that must be taken into consideration. Are Dog Whistles Effective for Training? The demeanor of your dog as it barks can give you a good idea of what it is they are trying to communicate. For example, if your dog is barking and his tail is tucked or his brow is wrinkled, he may be barking out of fear. A dog barking out of aggression may show his teeth more or take on a more defensive stance and the bark itself may sound more guttural and deep, according to the ASPCA. Some dogs bark during playtime or as a way to communicate their excitement. Say you are holding their favorite toy and they want you to give it a toss, the dog may bark to communicate what they want. This barking communication is usually accompanied by a wagging tail and marked signs of happiness. When your dog barks, pay close attention to his eyes and where he is looking. Are they focused on you or something else? Trying to see the world through the eyes of your dog can help you understand why they are barking. If you have an outdoor dog that tends to bark most of the night, take a trip outdoors, preferably unnoticed by your canine friend, and try to find what the dog is looking at when he is barking. Dogs of different breeds often bark at different times and each breed may have an array of different sounds. Some breeds, such as the German Shepherd or Alaskan Malamute, are documented as having as many as 12 different vocal variations of barking. However, other breeds may not be as vocal or communicative, such as the Great Dane or Newfoundland. Learning more about the breed of your dog and its history as a breed may give you insight into why he barks at certain times. The yelping sound is one that is much easier to understand for most pet owners because it is most often associated with a dog who is in pain. You may experience a yelping dog if he gets smacked by the claws of your cat or inadvertently has his foot stepped on, for example. Yelping is commonly followed or in conjunction with whimpering, which can also be conveyed as a message that a dog is in pain. According to The Whole Dog Journal, yelping and whimpering are common in wild dog packs between its members and the dog will expect those closest to react to the situation in a positive, comforting way. Even though whimpering and whining are sometimes associated with a dog who has been injured or is in pain, these communicating sounds can have other meanings as well. Whimpers and whines are usually made through the dog's nasal cavity, which means the sound is more high-pitched in tone. Dogs naturally hear higher-pitched tones better than humans, and therefore, this would be an effective communication tool in the wild when a dog is under stress. The dog may whimper or whine when he wants to be let out or is simply trying to get your attention. Puppies who have not yet developed their bark, will whine and whimper often as a way to communicate their stress and wants to their mother, or if the mother is not around, their human owners. Whimpering and whining can also sometimes take on the sound of "squeaking" depending on the breed of dog. It may also be described as "crying" by dog owners. Baying is sometimes misconstrued as barking and possibly even howling. However, baying is actually a different form of communication altogether than the average bark. This prolonged bark, often deep and throaty, is associated with a dog who is in pursuit of prey. Scent hounds, such as beagles, are well-known for baying when they are on the trail of what they are hunting. This is a desirable trait in dogs who are primarily used for hunting purposes as it helps to alert the hunter that the dog has found the scent of what they are hunting, such as rabbits or squirrel. However, some dogs may bay when they perceive a threat, such as an intruder in your home or another dog in their territory. Growling is an interesting sound in that it can indicate two completely opposite types of emotion. Growling is most often representative of a dog who is showing signs of aggression. If your dog is growling, or you come across a dog who is growling at you, it is best to heed their warning and not persist with whatever is making him stressed. Growling usually comes before a dog will attack if he feels threatened enough. This form of aggressive growling is typically accompanied by physical indicators that the dog is feeling anguished, such as an erected tail or hair standing stiffly along their back and neck. Your dog may also growl when he is playing, and this is normal behavior, particularly for certain breeds like terriers. If you are playing a friendly game of tug-o-war, for example, the dog may playfully growl at you. However, this type of playful growling is usually easily deciphered by the rest of the dog's body language, which should not be aggressive. Plus, the playful growl is often much different in sound than that which is threatening in nature, although not always. 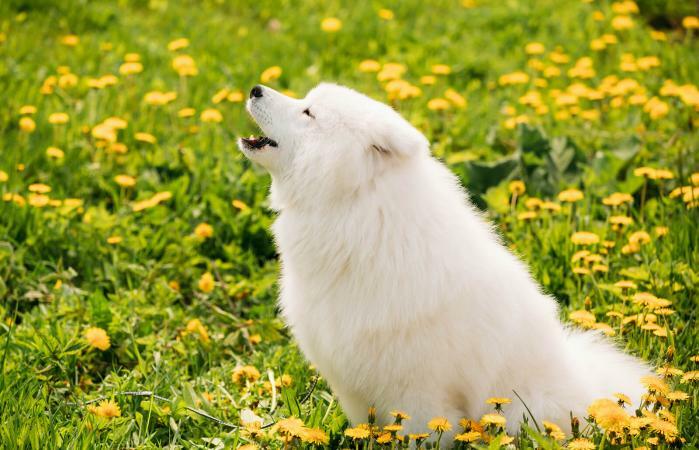 Perhaps one of the most characteristic sounds that a dog makes, howling is a vocalization that is deep-seated in a dog's nature. In packs, dogs use howling as a form of communication for various reasons. They often howl to communicate their location or attract attention. You may notice your dog howling when you leave him alone, which can also signify emotional distress. Dogs who have lost their owners are known to howl due to separation anxiety. Dogs can also howl in response to a sound or stimulus, like sirens or other noises that resemble howls from other dogs. If a dog is making a honking sound, this is actually a "reverse sneeze." It also is often described as choking. While this can sound and look worrying, most dogs get over it within a few minutes and it's a normal behavior. It usually occurs if their throat or soft palate is irritated, from eating or drinking too quickly, or if they've become overexcited from getting up too quickly or play. Some dogs will also make the noise if they're suffering from allergies. If you notice your dog dry heaving, this means he's attempting to throw something up from his stomach. He could have eaten something that caused his stomach to be upset or suffering from a very serious condition called bloat. Contact your veterinarian immediately as bloat can become quickly fatal if not treated immediately. A dog that is gagging or coughing may be ill with one of a number of conditions such as kennel cough, pneumonia, bronchitis, or even congestive heart failure. Speak to your veterinarian about your dog's symptoms and follow his or her advice. Dogs laughing - Your dog makes this sound in combination with relaxed body language including an open mouth, tongue hanging out and a face many dog owners describe as "smiling." The sound is a very soft, breathy noise. Dogs growling - While growling can mean a dog is feeling scared, threatened and on the defense, many dogs will growl during play time. This is sometimes also referred to as "purring." It's easy to distinguish happy growls from scared growls because of the dog's body language, which should be loose and non-threatening. Dogs barking - Happy, excited dogs will also bark to show they're enjoying themselves. Usually, this occurs during playtime and is accompanied by excited body language. Dog sighing and moaning - Contented, happy dogs will make sighs to indicate all is right with the world. You may also hear them making a "moaning" sound. If this is accompanied by relaxed body language, head on paws, and closed or semi-closed eyes, then you have a dog that's enjoying his life. If the dog makes the sound with open eyes, it could, however, indicate they're not happy about something, such as being kept inside when they want to go out and play or having to wait for dinner. If moaning is accompanied by hiding and stressed body language, this may mean your dog is ill and in pain. Many dog owners love watching their dogs sleeping because of their propensity to "dream." A dog that is in the deep stage of REM sleep will make all sorts of different body motions, sometimes appearing as if they're running in their sleep. They will also make a variety of noises such as chirps, whimpers, growls, snuffles, bubbles, and gurgles. Another common sleep noise is snoring. If you see your dog twitching and grumbling in sleep, it means they're likely dreaming of chasing squirrels in your yard or some other variation of their daily awake activities. When it comes down to it, your dog has an array of ways to communicate with you and it is highly likely that he will. Every dog is different in the number of sounds he or she can make that are part of their regular "routine." The longer you have your dog, the more you will learn to understand how he communicates and what he is trying to say. Some dogs are even known to try to replicate the sounds that their owners make as a way to communicate. Your best friend may not speak your language, but with a little time and understanding, there is no question that the two of you can communicate.